Sailing in Real Life: Finding Brave Again. Yup, visualizing,dreaming, doodling and painting endless mystical tall ships; these just spill over into real life in a most amazing way. Huh. I guess imagination and reality aren’t really separate, after all. Imagining bravery and courage isn’t separate from reality either. Albeit I’ve yet to be as swashbucklin’ and as much of a monkey in the rigs as the imaginary brave and courageous sailor who plays in my thoughts. 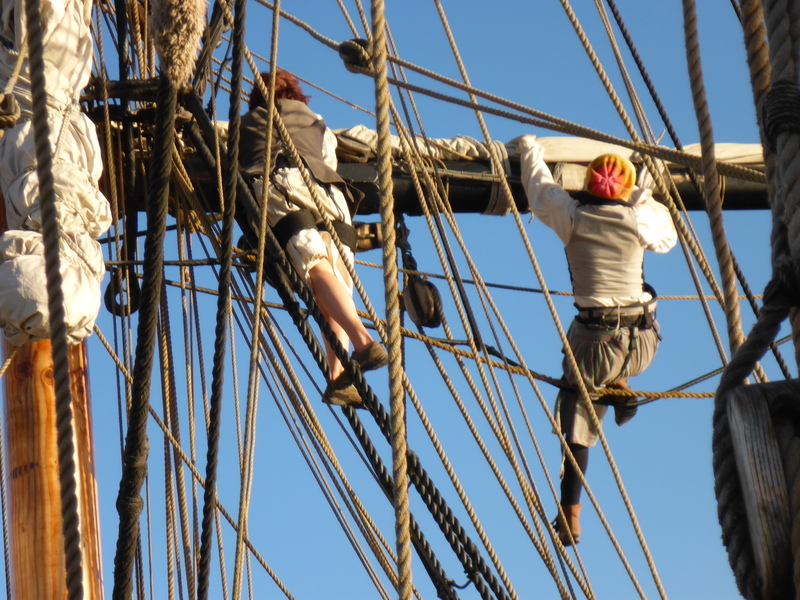 But the imaginary does get me on the deck of a real Tall Ship, and it gets me climbing aloft – with some anxiousness and trepidation – but still, climbing aloft. 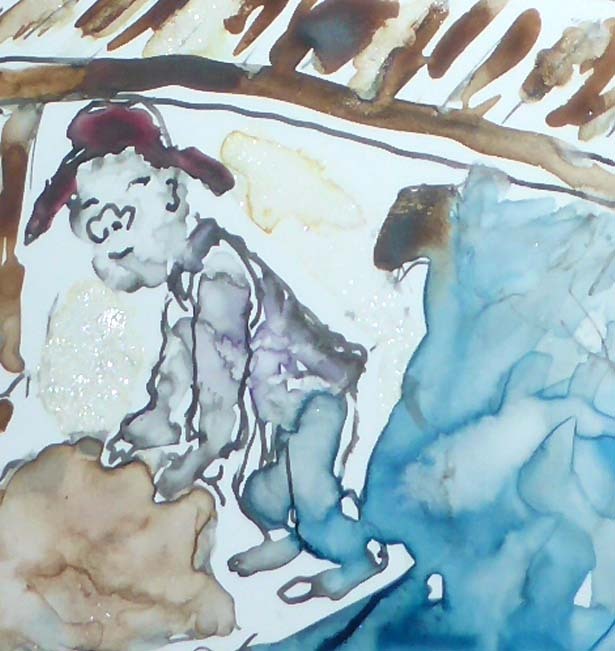 The imaginary hasn’t gotten me aloft while feeling seasick, or when it looked like the other sailors would be much better suited to be setting or furling sails in great rolling swells. Ha ha. But still. Imagining the possibility. Pretending I have a few seconds of outrageous bravery to commit to such a crazy adventure; those things have me, today, packing up for a week sail as crew on the Hawaiian Chieftain, granddaughter in tow because it’s a family adventure through the San Juan Islands!! I am nervous. I’m nervous because I’ve forgotten the knots and I don’t know all the lines on this ship. (Sister ship to the one I trained on, Lady Washington) I’m nervous cuz I’m really such a beginner sailor and will they have high expectations of me because I ‘made the cut’ in training? I’m not actually nervous about going aloft, but a little concerned about my strength, given I had an injury this spring that had kept me from getting really fit. It’s better now. But I’m not super strong. Oh wait. I’ll imagine super strong. And I’ll remember how stepping on the Lady Washington last fall triggered a strength I didn’t even know I had. I’ll think of these things, right now. And feel the energy of that in my body. I’ll imagine the swashbucklin’ wild red haired sailor chomping at the bit to get back to the sea and who knows every knot every concocted. 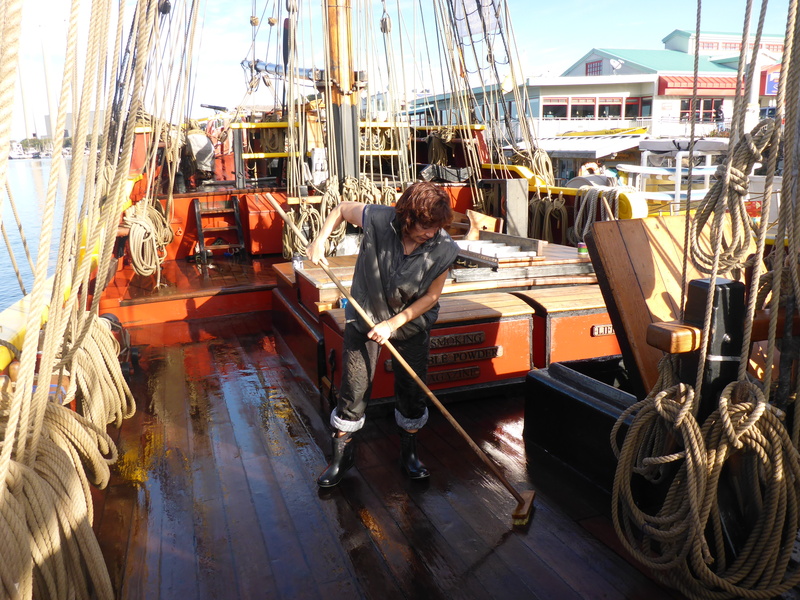 Soon to be scrubbing decks, but on the Hawaiian Chieftain. I do love scrubbing decks! P.S. 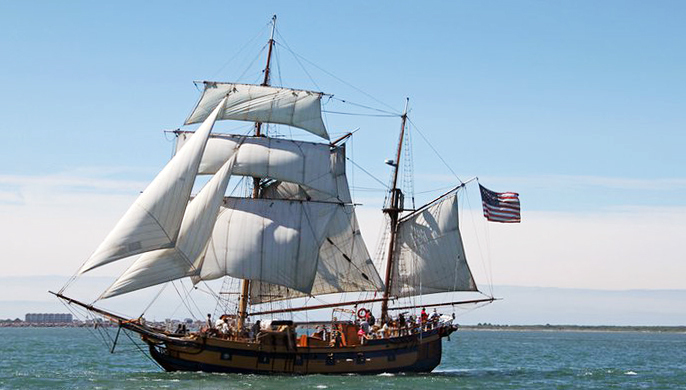 If you’ve ever wished you could sail on a Tall Ship, Grays Historical Seaport, with their two ships Lady Washington and the Hawaiian Chieftain, are the most welcoming organization, dedicated to the education of sailors and children, and to keep the history and spirit of Tall Ships alive. Posted in Lady Washington Adventure and tagged finding brave, finding courage, Grays Harbor Historical Seaport, Hawaiian Chieftain, imagination, janet whitehead, Lady Washington, sailor training, tall ship sailor, visualizations. Bookmark the permalink.